The hacker going by the handle “orin0co” claims to have phished the Apple CEO in a new trend called “whaling” or “spear phishing.” Instead of sending out millions of spam emails, “whaling” instead focuses on trying to phish high-worth victims like well-known CEOs and celebrities. Jobs has purchased 20,000 items from Amazon.com in the last 10 years, the hacker says. That’s 2,000 items a year, or more than 5 items a day, every day. 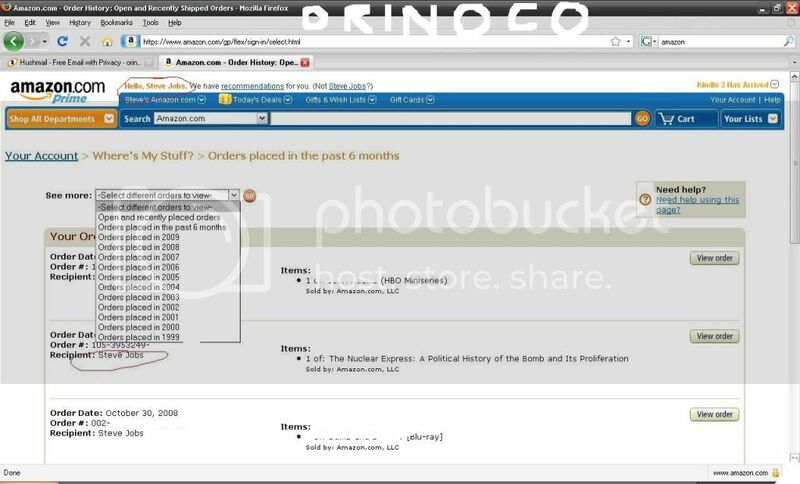 As proof of the attack “orin0co” includes a screen shot (above) that apparently shows him logged into Jobs’ account. But we all know that it’s easy to fake a screenshot. The attack has not been confirmed by Apple or by Amazon and there are some questionable parts of the story, but it’s an interesting read nonetheless. If this story is true I think that this is not an hacker, he is a thief. It is claimed to be a phishing.. Which is an attack, done on a human, rather than a software.. Victim can be on any platform or browser, FreeBSD, Linux, Windows, MAC, Solaris, anything..
Any one can create a page, which looks like Amazon.com and if you are stupid or careless enough in not noticing the domain, then you can fall pray to phishing regardless of OS / browser and AVS protection..
On another hand, the information could have leaked out from Amazon itself !! !